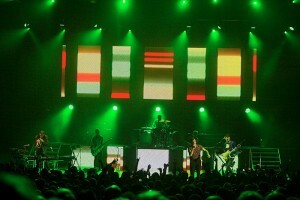 The video and lighting design was by Paul Normandale. He was approached by management and asked to come up with an inventive concept specifically for the sold-out Hammersmith Apollo show on the band’s latest UK tour. Once again, he teamed up with XL Video to help make this happen, working closely with XL’s project manager, Gareth Jeanne. 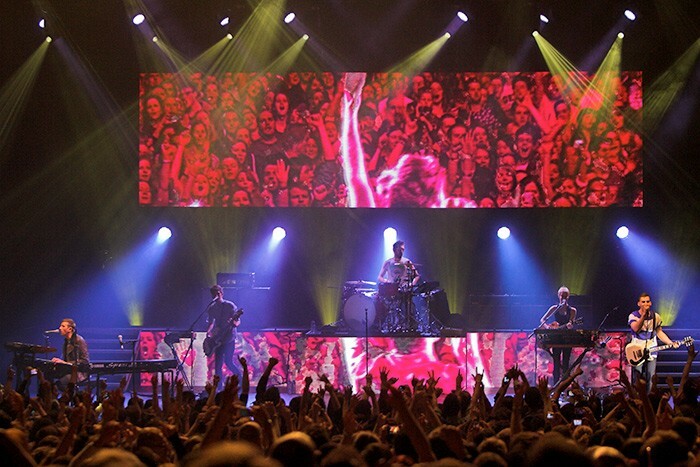 The video design was based on a poster of the band. Normandale wanted everyone in the room to be able to see a bigger picture rather than those at the front being bombarded just by a load of fragmented pixels, and this informed his choice of LED surface. He collaborated with Cincinnati based design studio Lightbourne who produced the video playback content and the whole video look and idea brought a nice sense of quirkiness, humour and visual intelligence to the stage. Upstage there was a rectangular screen made up of semi-transparent Pixled F-12, specified because the LED starcloth at the back would be visible through it during certain songs. 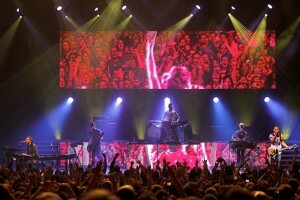 Normandale was also one of the first designers to use the F-12 when it was launched last year – on Coldplay’s world tour. The fronts of the three band risers were clad with Pixled FX-11 – its dimensions were the nearest match to the depth of the riser fronts. At FOH, XL supplied two Barco HD20K projectors which were used as an effects lightsource in dramatic full over-stage projections, bringing a completely different feel to the show at strategic moments. All the LED was fed by two Green Hippo Hippotizer media servers, programmed and run for the day by Ben Miles using a grandMA2 light console which was specified by Normandale. XL also supplied four Bradley Cam-Ball 2 robo-cams used for the often heavily effected IMAG. These were positioned upstage and downstage left and right so they were able to catch a wide selection of shots including some impressive reverses of the audience. Additionally, there were a couple of mini-cams dotted around the stage. The cameras were operated and cut by XL’s Dave Rogers using an AVS-HS400 mixer/switcher, and one TX feed from that was sent to the Hippotizer to be sized, mask affected as necessary and then output to screen by Miles. The real challenge for Jeanne, Rogers and Miles, who were joined on the day by XL LED technicians Matt Doughty and Matt Gourd, was the tight time scale, getting in at 7am on the day and having to set up and programme in time for doors, not having previously seen the show. All these objectives were achieved smoothly and seamlessly, resulting in a fantastic looking show with exciting and fun visuals. In fact, looking at it, most would have thought it had been out for some weeks on tour it was so polished. Fraser Elisha was the lighting director, Lite Alternative supplied the lighting equipment and SSE the audio kit.